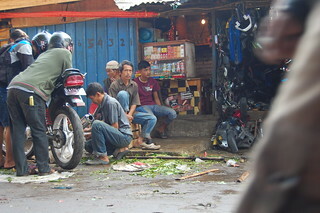 "Pasar Ciroyom" is one of great markets in Bandung. It is one of main gate that supply of daily goods entering Bandung; trucks unloads their goods here, at the west side of Bandung. Either some meal sellers come to buy ingredients for their kitchens here or those stuffs are distributed to smaller markets around Bandung, Ciroyom is labelled as part of "traditional market's supply and chains". The problem that arises with "traditional" label is they are so traditional that no major improvements taken. Poor conditions, social diseases, and atop of them is lack of management. A big dilemma that people are persuaded to shop in traditional market, with a reason to support local farmers and suppliers, market's condition has not yet been improved.